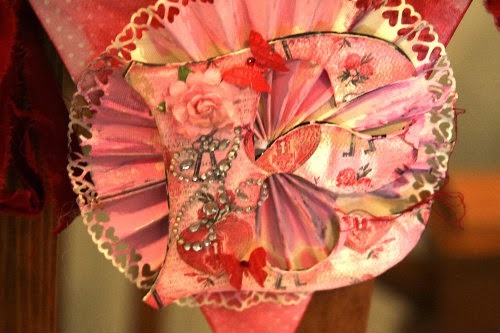 Good morning crafters and paper artists. 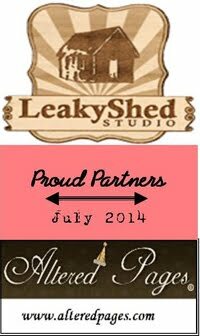 Welcome to the collaboration between the Leaky Shed Studio Design team and the Authentique Paper design team! Are you ready to be inspired? 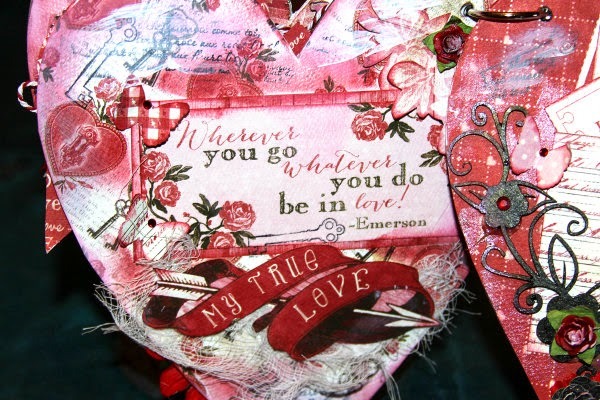 The next 3 days will filled with fun projects you can create for Valentines Day or just for fun. The two teams have been playing with Authentique's beautiful Smitten collection and the Leaky Shed Studio's chipboard pieces. 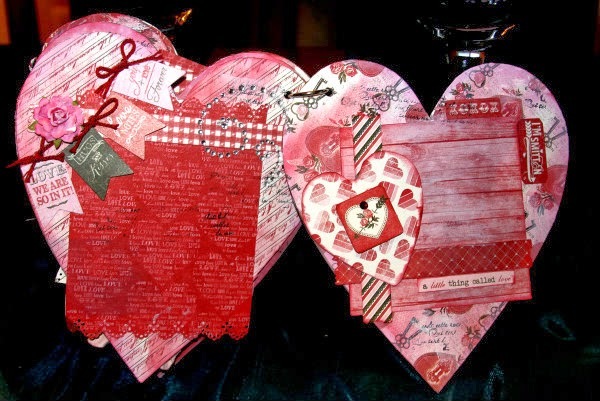 These products are amazing on their own but teaming them up together they make beautiful Valentines Day projects. Let's start of with a banner! The swirly heart was painted black and then highlighted with Viva Inka in Antique Gold. In the center of the heart, clear liquid adhesive was applied and seed beads and sequins were added for sparke. Tiffany started out by adding some texture by using a mask and some modeling paste. 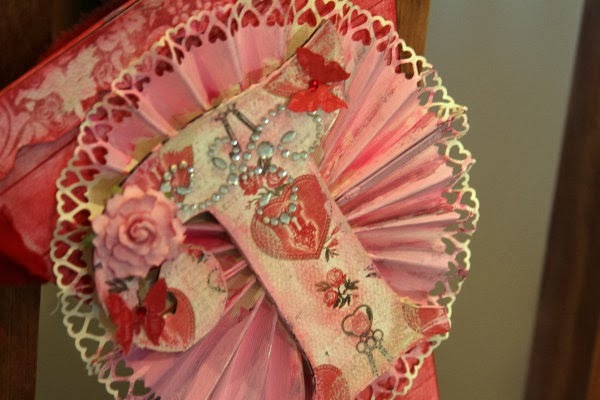 She added some Manor House Creations flowers, lace. 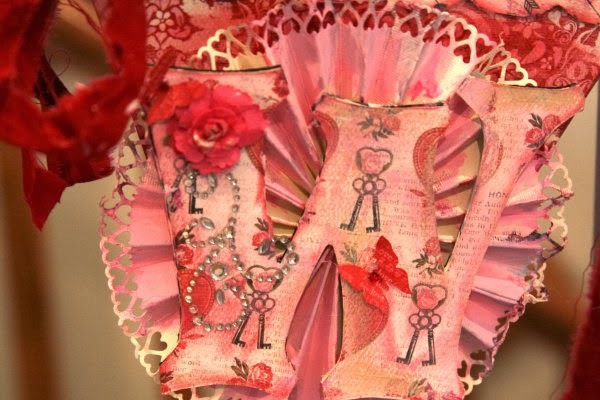 Leaky Shed Studio's Cupid chipboard piece was used for the cherubs heart. 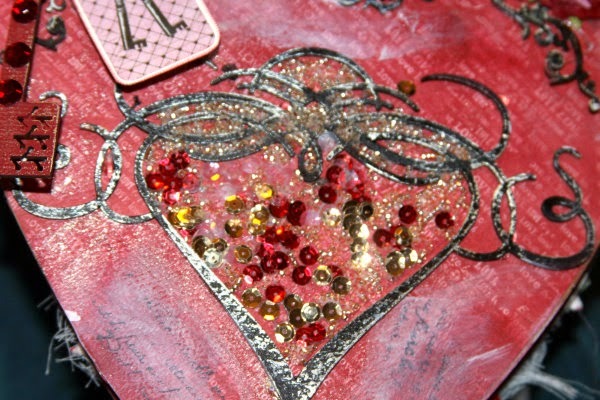 She treated it with some gesso and then some distress paint and then added some Shimmerz Texturez on the heart. The butterfly was painted with distress paint. 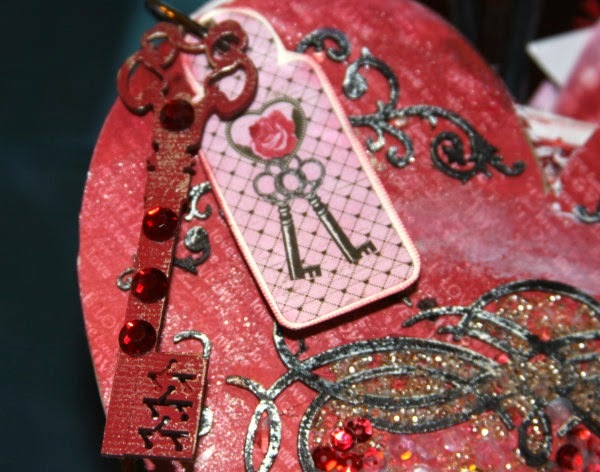 Tiffany used embossing powder on the Cupid and then added some ribbon to give it a nice little touch. 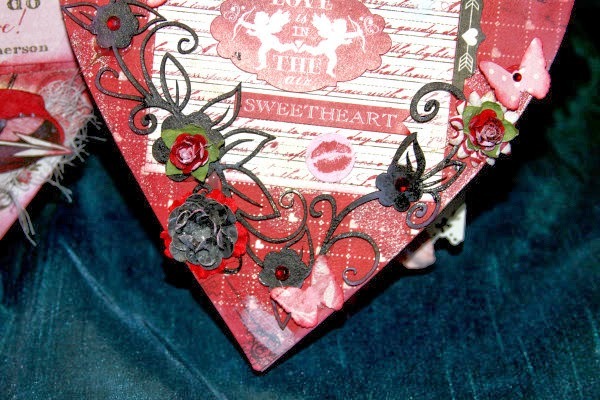 Using the Smitten paper collection Tiffany created 4 squares and layered the papers together to create a quilt effect.. She used embossing powder on the small ring chipboard piece. Follow us on Facebook. Easy Peasy! Hope you enjoys all these gorgeous projects today. If you haven't been to the Authentique blog yet, head over there for more inspiration from their design team. I love the hearts with key legs. It really gets the point across - you have the key to my heart. All of the projects were great. Thanks for showing us so many beautiful projects. How beautiful! I love the look....very inspiring as I am getting ready to begin an album of my Grandma and Grandpa's photos. Thank you so much for an opportunity to win....the products would be so amazingly perfect for my grandparents album. Oh YES please! 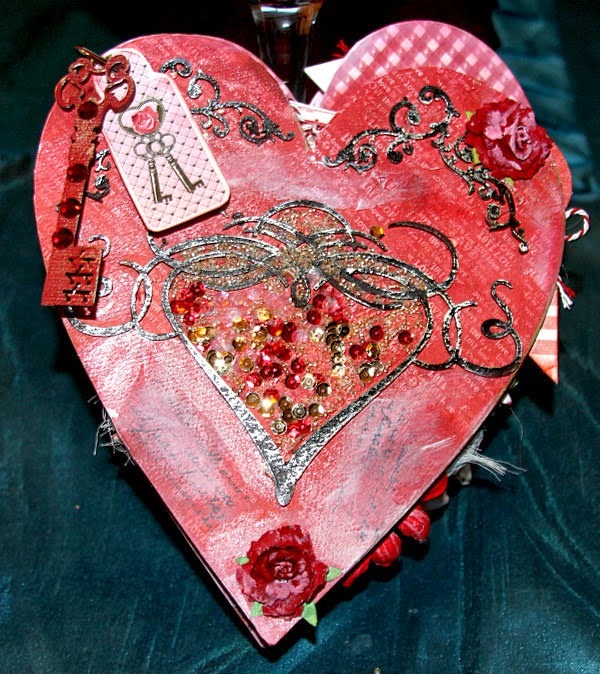 I would love to win this amazing chipboard! Lovely projects. I love your chipboard. Gorgeous projects!! Love how the designers worked with the Authentique collection and showcased the beautiful chipboard. Wonderful projects - well done! I've never heard of you guys so I'm so glad to meet you! and I come over here and see that I have a chance of winning it! PS I;m a new follower too! Am I missing it somewhere? I would love to follow by email but can't seem to find where to sign up?? Vicki I added a gadget so you can follow by email. I would LOVE to win it!!! Gorgeous details! Awesome projects! Love all the details and dimension! Great giveaway! Gorgeous projects, thanks for the chance to win! Wonderful projects! I'm a follower. Wonderful creations! Sure puts me in the mood for looove! :) Thanks so much for the chance to win such an awesome giveaway! I would love to win the chipboard. The heart album is so be beautiful. It will be a great keepsake. All of the projects are great. So glad I found this site. 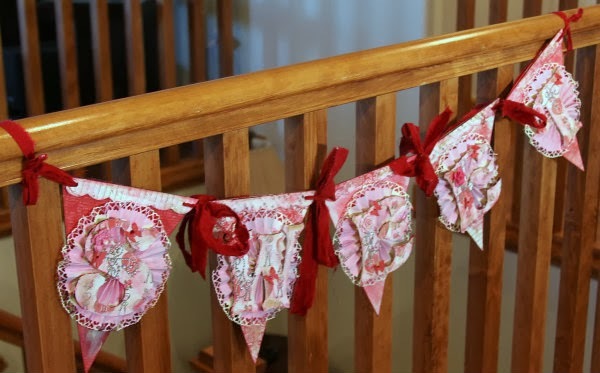 Lots of pretty projects! Thanks for sharing! I left a comment early I don't see it . I love the chipboard. I would love to win it. Thanks for the chance to win. I liked you on Facebook. I am so delighted to learn abt Leaky Shed. I am loving what I have seen on your blog and on Authentique using your products. Wowza!!!! Gorgeous. Forgot to mention, I am a fan on FB!! awesome projects! love the blog,now a fb fan!! WOW! I love the projects that have made by combining your products with the Aunthentique products (they're truly some of my VERY fav papers & I've been waiting to to get my hands on the new Smitten collection!). Judging from many of the other comments, it looks like I'm not the only one discovering you today...obviously you've done a great job of getting our attention & capturing our interest...way to go! Thanks for the chance to win such an awesome giveaway...I'll keep my fingers crossed!! Heading over to your fb page now! I hadn't heard of LSS until I stopped by the Authentique blog today...sure glad I did! LOVE your projects and products. What a fantastic prize. I absolutely love Leaky Shed. Thank you for the chance to win this. I gladly follow Leaky Shed on Facebook and Pinterest. Gorgeous projects! Loving all that chipboard. I just adored the banner! Stunning work and the details are to die for. Wow!!! All these projects are gorgeous!!! 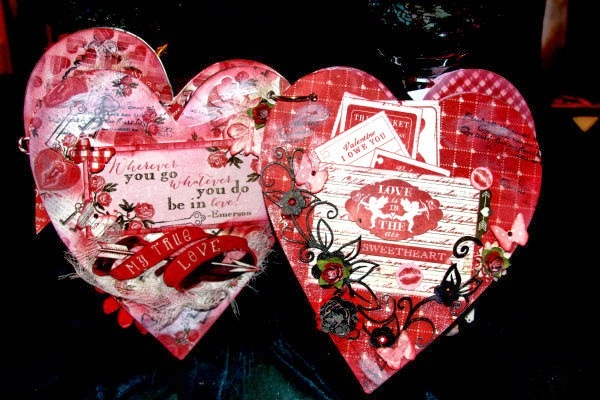 Reminds me of vintage Valentines. Thanks for the chance to win this fabulous prize. I'm a facebook follower. Love these vintage looking projects. All gorgeous! So cool how Tiffany used embossing powder on the ring to achieve that look. Great idea! FB liker and thanks for the fun giveaway! 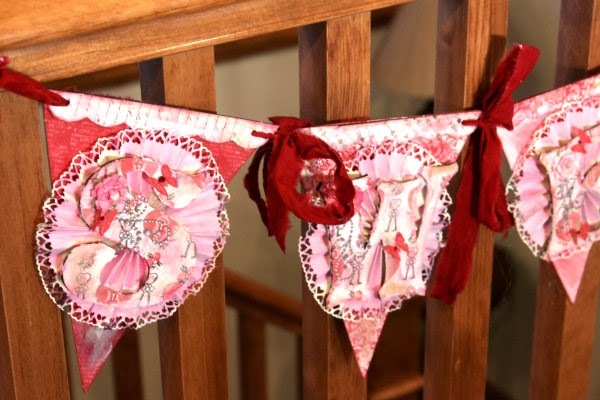 Gorgeous banner...makes me want to go and make one right now!! super cute layout, too! 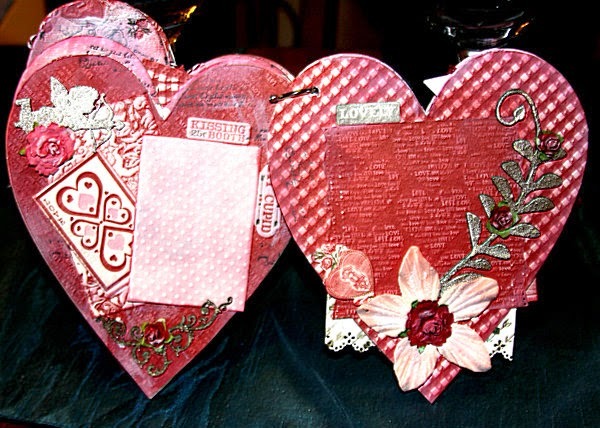 Cool chipboard pieces!! Beautiful projects....love all the detail in the mini album....wow!!! Fantastic projects!! Love the distressed look of the lo and card. LOVE LOVE LOVE the BEAUTIFUL projects, from the SWEET banner & AWESOME album, to the LUSCIOUS layout and CUTE cards - the colours, layers, textures, shapes and bling are a DELIGHT!! !